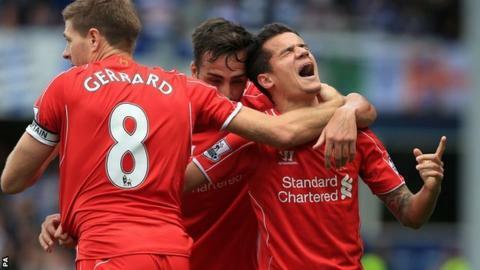 Four goals in a breathless final eight minutes ended in Liverpool clinching a dramatic win which kept QPR bottom of the Premier League. Liverpool led through Richard Dunne's record 10th Premier League own goal before Chile striker Eduardo Vargas levelled with his first QPR goal. Philippe Coutinho drilled in to put Liverpool back ahead, only for Vargas to equalise again in injury time. QPR's Steven Caulker then diverted into his own net to move Liverpool to fifth. The defeat was harsh on newly-promoted QPR who dominated most of the match without taking the scoring chances that they created. And they were taught a harsh lesson as Liverpool, last season's runners-up, climbed into their joint-highest Premier League position of the season. QPR have struggled on their return to the top-flight, claiming just four points in their eight matches, and leading to speculation that manager Harry Redknapp's position is under threat. QPR have failed to score in 11 of their last 14 first halves in the Premier League. Liverpool have kept just one clean sheet in their last 14 Premier League matches. QPR's Leroy Fer has struck the woodwork three times so far this season, the most in the Premier League. Liverpool's Mario Balotelli has had 26 shots this season in the Premier League - only two players (Aguero 36, Pelle 32) have had more. The 67-year-old insisted before kick-off that he is not under pressure, but was left cursing his luck at the final whistle - looking to the west London skies in disbelief - as he wondered how his team failed to earn at least a point. A draw would have moved them above fellow new-boys Burnley, who are still winless after Saturday's defeat against West Ham. QPR's work-rate has been criticised by some observers but they looked reinvigorated by the international break - and the five changes to their starting XI - following the 2-0 defeat at West Ham. Former England striker Bobby Zamora was one of the players recalled, with the hope that his physicality would unnerve a Liverpool defence which had kept just one clean sheet in their previous 16 matches. And Redknapp's plan worked during a first half in which QPR hassled and harried their opponents into defensive mistakes. Zamora's movement and strength left Liverpool looking bedraggled and the 33-year-old teed up the two efforts which saw Leroy Fer rattle the woodwork before half-time. QPR continued where they left off in the first half as Sandro's stinging shot was pushed to safety by Reds keeper Simon Mignolet, before Charlie Austin flashed a low effort across goal from a tight angle. The Hoops deserved to be ahead on the number of chances created, but were punished when Raheem Sterling's quick free-kick ended in Dunne hacking into his own goal. Redknapp introduced on-loan Napoli forward Vargas with little more than 10 minutes left and he made an instant impact by smashing in Austin's knockdown for the first equaliser. Sterling has been the centre of attention in a week where debate about his physical condition dominated the media - and now the focus will rightly switch to the England international's talent. The 19-year-old, who started his career in QPR's academy before moving to Anfield, was largely anonymous as Liverpool largely failed to find their rhythm. But he burst into life when it mattered as Liverpool showed the character to carve out an important win. Sterling began the move which set up Coutinho's goal, which was cancelled out by Vargas' second, before his square pass was bundled into his own net by Caulker for the winner. Have a look at some of the best photos from today's Premier League games on the BBC Sport Facebook page. Match ends, Queens Park Rangers 2, Liverpool 3. Second Half ends, Queens Park Rangers 2, Liverpool 3. Substitution, Liverpool. Kolo Touré replaces Raheem Sterling. Own Goal by Steven Caulker, Queens Park Rangers. Queens Park Rangers 2, Liverpool 3. Attempt missed. Mario Balotelli (Liverpool) right footed shot from the right side of the six yard box is close, but misses to the right. Assisted by Glen Johnson with a cross. Goal! Queens Park Rangers 2, Liverpool 2. Eduardo Vargas (Queens Park Rangers) header from the centre of the box to the bottom left corner. Assisted by Leroy Fer with a cross following a corner. Corner, Queens Park Rangers. Conceded by Raheem Sterling. Goal! Queens Park Rangers 1, Liverpool 2. Philippe Coutinho (Liverpool) right footed shot from the centre of the box to the bottom right corner. Assisted by Steven Gerrard following a fast break. Corner, Queens Park Rangers. Conceded by Martin Skrtel. Attempt missed. Steven Caulker (Queens Park Rangers) header from the centre of the box misses to the right. Assisted by Charlie Austin with a cross. Karl Henry (Queens Park Rangers) wins a free kick in the attacking half. Goal! Queens Park Rangers 1, Liverpool 1. Eduardo Vargas (Queens Park Rangers) right footed shot from very close range to the centre of the goal. Assisted by Charlie Austin with a headed pass following a set piece situation. Philippe Coutinho (Liverpool) is shown the yellow card. Charlie Austin (Queens Park Rangers) wins a free kick in the attacking half. Attempt saved. Mario Balotelli (Liverpool) left footed shot from the right side of the box is saved in the bottom right corner. Assisted by Jordan Henderson. Corner, Queens Park Rangers. Conceded by Simon Mignolet. Attempt saved. Armand Traore (Queens Park Rangers) header from the centre of the box is saved in the bottom right corner. Corner, Queens Park Rangers. Conceded by Joe Allen. Delay in match Martin Skrtel (Liverpool) because of an injury. Martin Skrtel (Liverpool) is shown the yellow card for a bad foul. Karl Henry (Queens Park Rangers) is shown the yellow card for a bad foul. Substitution, Queens Park Rangers. Eduardo Vargas replaces Bobby Zamora. Alex McCarthy (Queens Park Rangers) wins a free kick in the defensive half. Glen Johnson (Liverpool) wins a free kick on the right wing. Foul by Armand Traore (Queens Park Rangers). Attempt blocked. Mario Balotelli (Liverpool) right footed shot from the right side of the box is blocked. Assisted by Steven Gerrard. Attempt saved. Charlie Austin (Queens Park Rangers) right footed shot from outside the box is saved in the bottom right corner. Assisted by Bobby Zamora. Raheem Sterling (Liverpool) wins a free kick in the defensive half. Foul by Mauricio Isla (Queens Park Rangers). Glen Johnson (Liverpool) is shown the yellow card for a bad foul.